Eliminates card decks and uses electronic module instead. Module assigns the next operation with a sound effect, presumably at random. 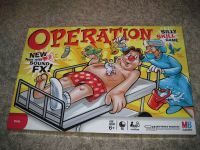 Each player tries to complete the operation, and only when one succeeds does the game progress to the next operation. No volume control, alas. But there is a no-sound-effect setting, so it's possible to play this the traditional way if you create your own cards. The electronics allow a "beginner" setting that ignores light touches against the metal edging.